J.W Anderson looked to a certain Tudor monarch for SS17. 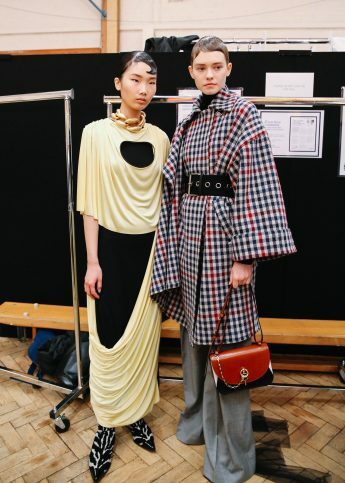 Anderson’s eponymous brand has basically become the marmite of the fashion world, and with the originality of his ideas it’s kind of understandable why. Like it or not, there are people who simply cannot get their heads around some of his more outlandish creations. This collection might be the one to win the naysayers over however, as it is a more toned down, paired back and commercial than previous offerings – yet still maintaining that JW wit and intelligence. Where to start? The bags were exceptional, Anderson is really coming into his own in the leather department since being made creative director of Loewe in 2013. Electric blue bucket bags with rope handles and squishy red rucksacks are sure to be big sellers after the Loewe Puzzle Bag reached giddy It-bag heights. Cascade earrings were fabulous as were the donut collars and cuffs of the latter half. Anderson always has a plethora of interesting references in his designs – many of which will be unveiled to us in next year’s exhibition at the Hepworth Gallery – and this show was no different. The Irish designer described his source of inspiration as none other than Henry VIII, whose masculine wardrobe he translated for the modern female dresser. The irony of dressing women in clothes inspired by a contender for the History’s Number One Wanker Awards (disclaimer: not a real thing) is interesting, but irony is one of the things which Anderson does best. No matter how many awful atrocities Henry Tudor committed to women-kind, including beheading two of his own wives, we must for a moment put that thought to one side and concentrate our attentions on the quilting of his waistcoats or the volume of his sleeves, as Anderson has done. Gender is an ever present theme in Anderson’s work, not a season goes by when he doesn’t subvert the “rules” in some way or another, probably a reason he divides people’s opinions so much. The Tudor definition of masculinity in respect to dress was notably different from today’s. Hose and overgowns featured heavily in a Tudor man’s wardrobe, items we would now more readily associate with female dress, and there was far more embellishment than you would expect to see on a man today, more sumptuous fabrics too. It seems a natural period in history for Anderson to look towards, and he has taken the subversion a step further by adapting the references into womenswear: burlap dresses were proportioned to elongate the torso and sleeves were voluminous, as if hiding hefty arm muscles.